It hardly seems possible that we are finishing our 7th month in Georgia. But it is true. 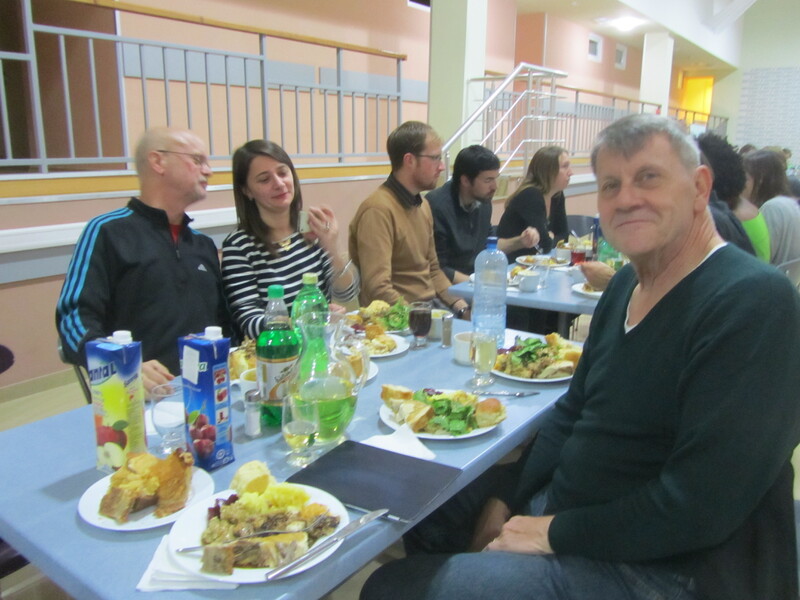 It is also hard to believe that we just celebrated our first PC Thanksgiving…in fact, we had 2 celebrations: one with all the volunteers gathered in Bazaleti and another with a few PC friends here in Batumi. Our 1st celebration was with over 100 people at a conference center where we were also joined by the ambassador and his wife after a week of language, safety updates, general sharing of al kinds, and choosing of new committee members. We had turkey, mashed potatoes, stuffing, beans, gravy, rolls, pumpkin pie, apple crisp and other goodies! 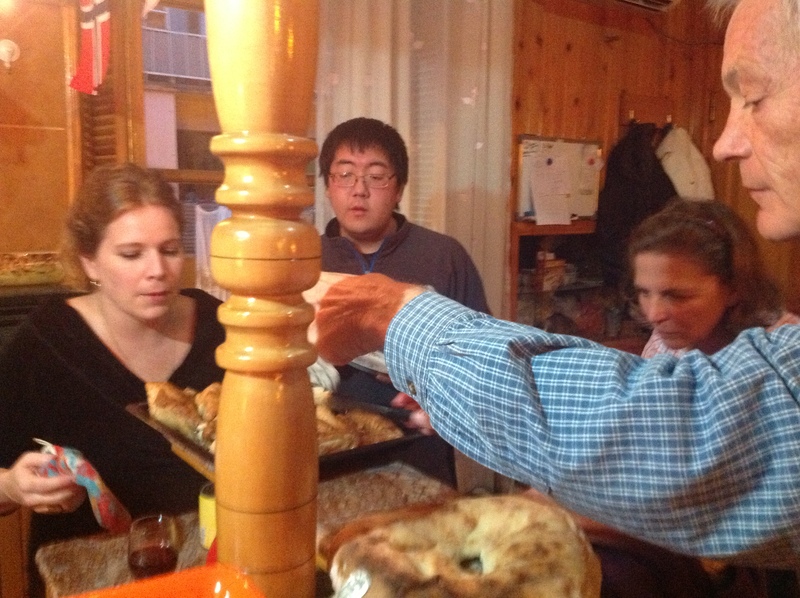 There was also sufficient wine of all varieties ….enough to satisfy everyone. Can you imagine the clean up? 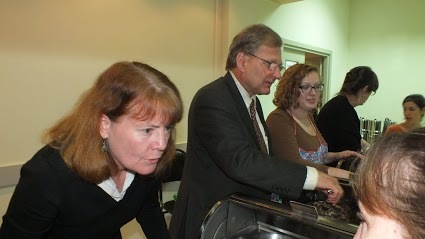 The Ambassador and his wife serving the volunteers. A good feast was had by all. Everyone ready to enjoy full plates of food. 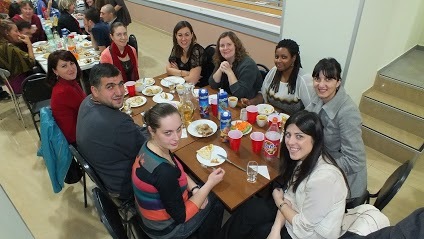 On Turkey Day, we gathered in Batumi with 4 other PC friends and repeated the process. Only this time, more intimate conversation and less noise. BUT…the same amount of wine. (In case you aren’t aware, wine flows freely in Georgia. Both store-bought and homemade.) We ended our smaller meal with a freshly baked apple crisp from my mother’s recipe! It was yummy! Amy, Adam, Tami and Richard filling their plates. 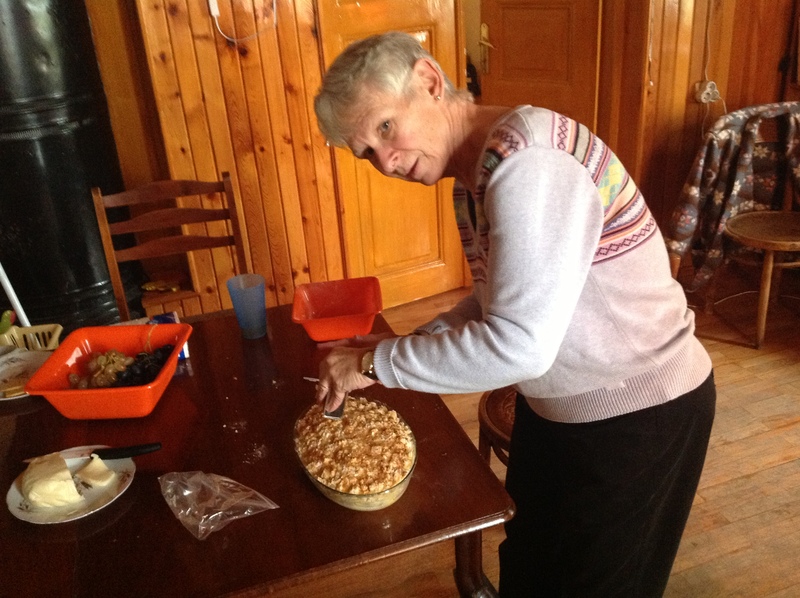 Suzanne preparing her apple crisp. This year we gave thanks for so very many blessing. Not only all of you who are so generous in reading this blog but for our many new friends, our good health so far and for the family with whom we live. Winter is coming. The petchi stove is in the house and working its magic. However, that magic doesn’t come all the way up to our second floor room. So, our small electric heater is now doing its best to take the chill off our living space. From all reports this is a much milder late Autumn than last year. We understand from many that this time last year there was much snow and extremely cold weather with no sun for many days at a time. The very best news for us is that we have attained the language level that the PC requires and are free to stop our tutoring. We will not, however, as we both want to achieve a greater vocabulary and fluency. So we will continue with a tutor but in a much more relaxed atmosphere and after some time off. School is getting better but is still a challenge for Suzanne. In another week, Suzanne will be attending a 3 day workshop on Project Design and Management which will give the skills to write a grant to help fund a project that the school needs. Tom’s work is developing as he finds his niche with his organization. He has completed the 1st half of a Capacity Assessment of the organization which will help him develop much-needed trainings. We both have English Clubs at our work sites. Among the many fruit trees surrounding our neighborhood are the Mandarin trees. 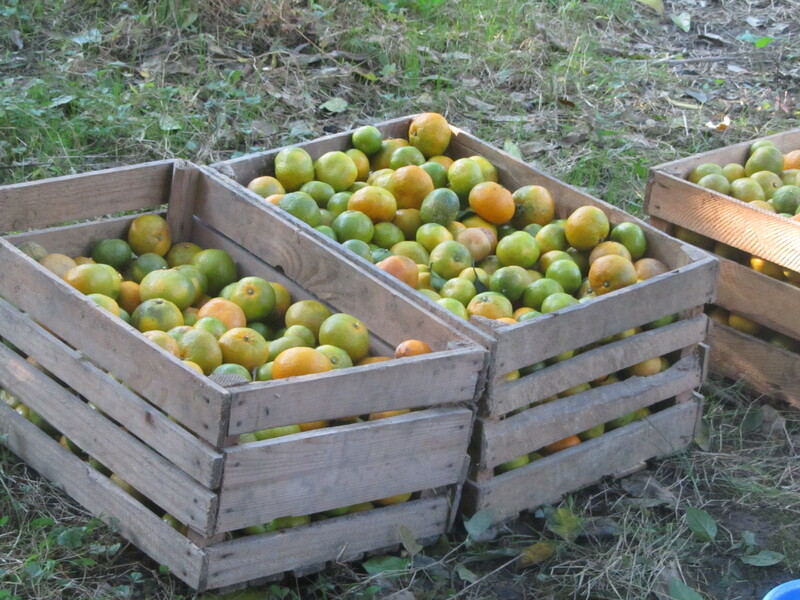 They are ripening now and today we went to watch Meri (host Mom) gathering the harvest. Their family has quite a lot of trees but they are plentiful throughout the area. All the children are bringing to school. 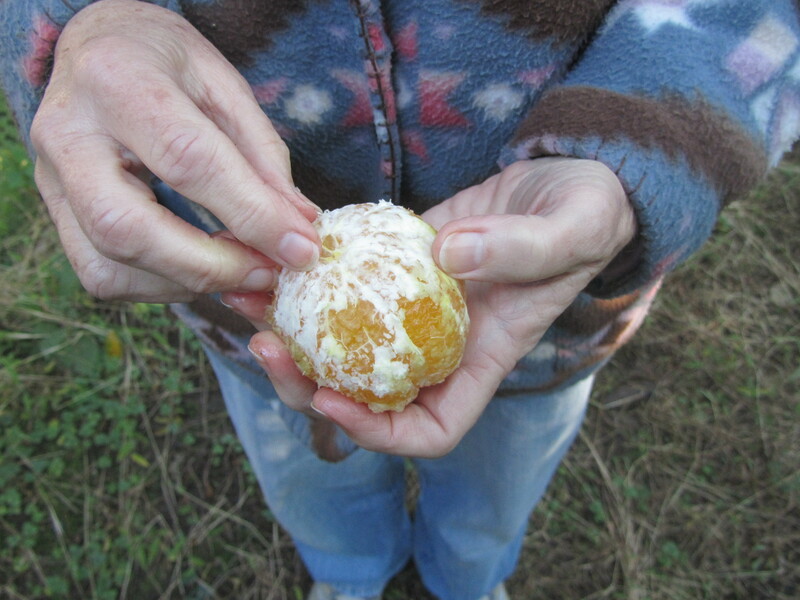 We also had a taste of an orange pulled right from the tree which was sweet and juicy with no seeds. Amazing. 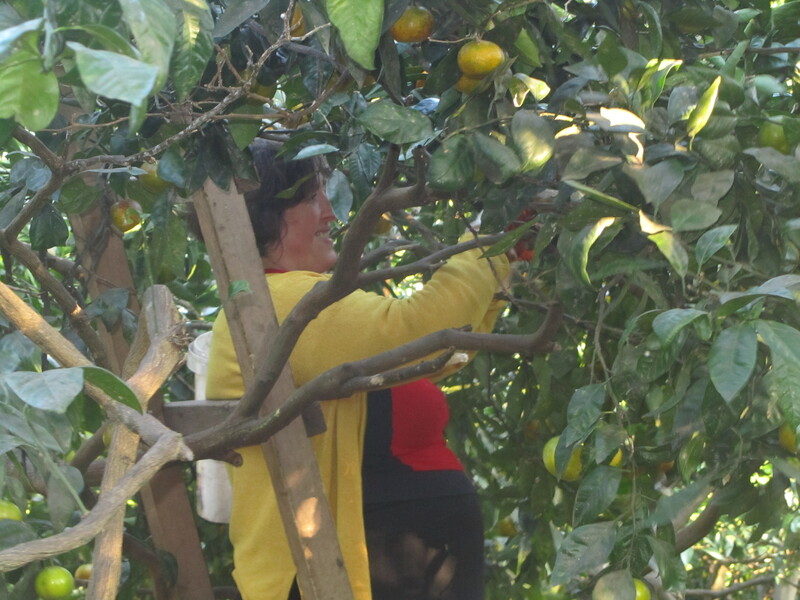 Meri clipping Mandarins from the tree. 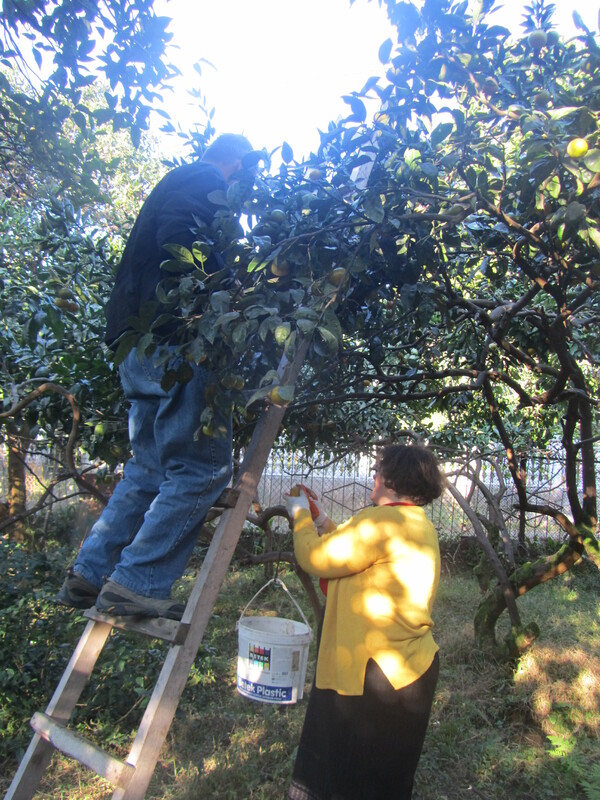 Tom and Meri picking fresh Mandarins. A bountiful harvest, and this is only the beginning. We close with some pictures of recent days you might enjoy. We love hearing your comments and your emails about what is happening in your busy lives. 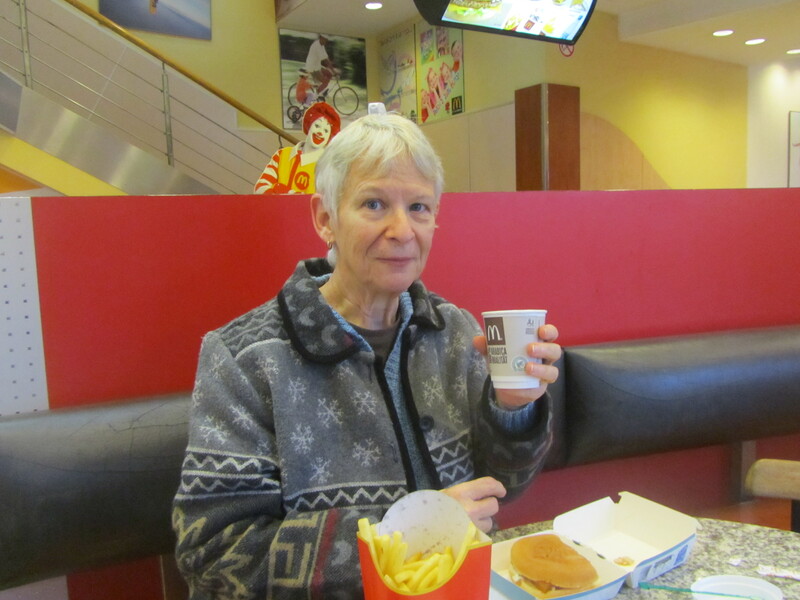 Enjoying a cup of American style coffee at a McDonalds in Tbilisi. 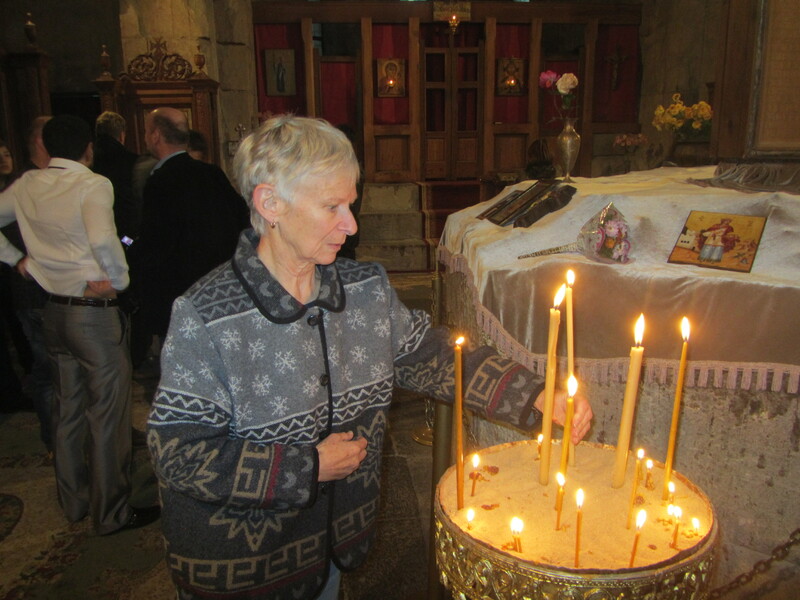 Lighting a candle in a 7th century Georgian church. 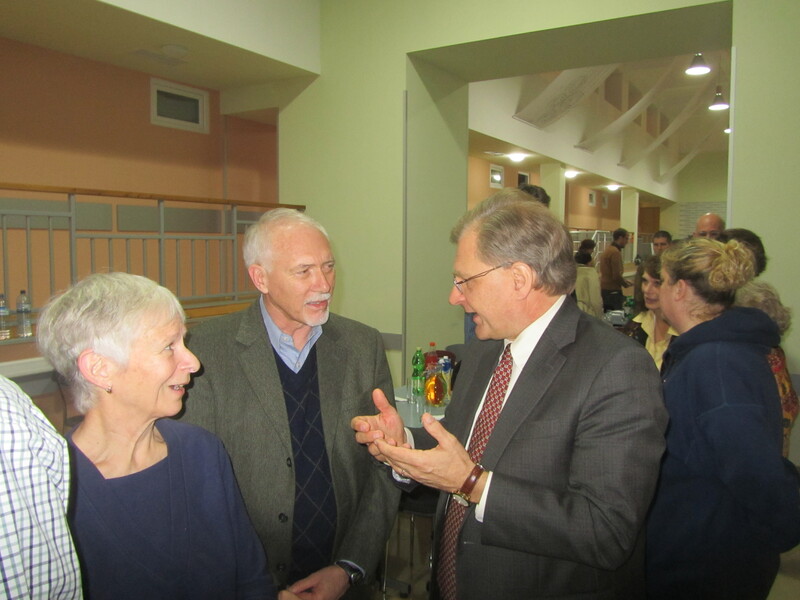 Suzanne enjoys a chat with the Ambassador and our Country Director. 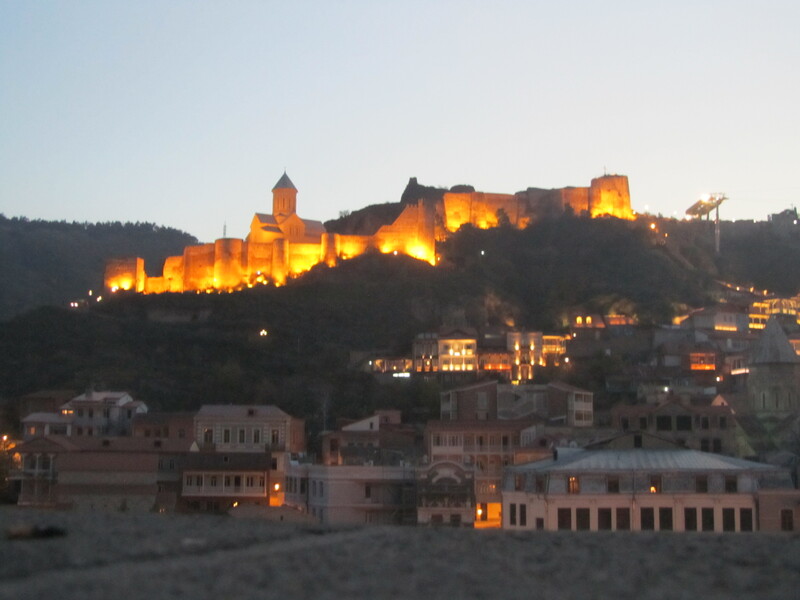 A Tbilisi landmark in lights at night. 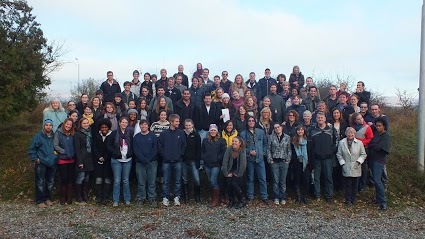 All 81 Peace Corps Volunteers in the country of Georgia! Blessed Advent season to all!